Ballpark Basics: A timeless ballpark that seamlessly blends the past with the present. Ballpark Breakdown: When we were setting up this year’s annual 4th of July trip we decided on touring the southeast. Initially Montgomery, Alabama was not on our list. After Gillian realized that the team name was the Montgomery Biscuits we decided we had to extend our trip an extra day just to check that out. Background info: The team was named after a “Name the Team” contest and the biscuit is a nod to one of the South’s favorite food. As our excellent tour guide , Sarah, stated ” It doesn’t get more Southern than biscuits, and we like it that way!” The team was the first ever to be named after a food and they take pride in it. But more on that later – first, let’s talk ballpark. 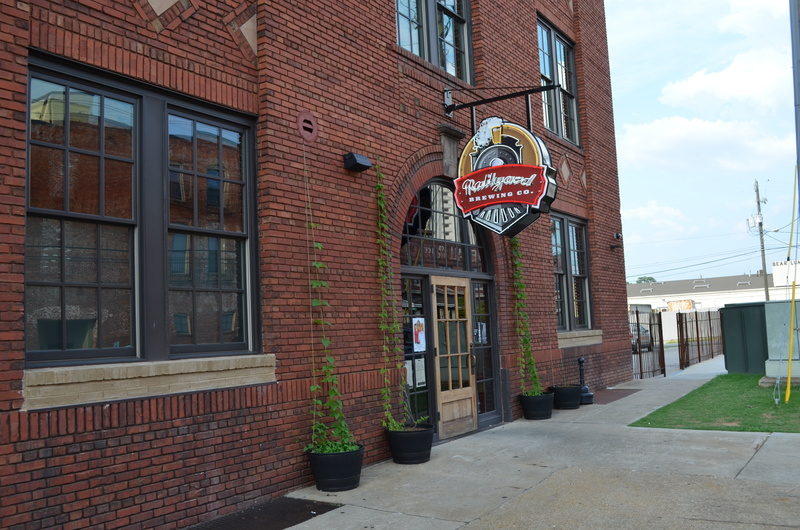 Walking down Tallapoosa Street in downtown Montgomery you would never even notice that you were about to walk into one of the nicest ballparks in the Southern League (or all of Minor League Baseball). The only clues are the small sign at the corner of Tallapoosa and Coosa Streets and the light poles that stretch into the sky. Riverwalk Stadium does a great job of blending in with the rest of historic downtown buildings and from the outside, the ballpark looks like it has been there for generations. That is because the outside of the stadium is housed in a former train shed that dates back to 1898. Step inside and you will how the Biscuits have blended the past with the future to make a near perfect park. HOK+ Sport (now Populous) the company who designed Riverwalk Park, was also the company who designed Oriole Park at Camden Yards in Baltimore and there are many similarities between them. They both incorporated a train station into the architecture of the park. While Camden Yards recently celebrated its 20th Anniversary we visited Riverwalk Stadium on its 10th Anniversary. Just like the Orioles’ home, Riverwalk Stadium has aged very gracefully. Both ballparks seem timeless. The first base side houses the re-purposed train yard. This contains sheltered concession areas, the Blue Car Bar, and suites on the second level. 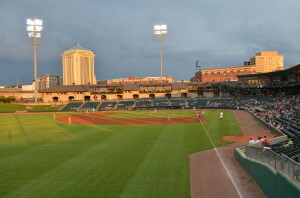 The former train yard wraps around home plate and houses the box office, the main entrance, the team store (fittingly called the Biscuit Basket), and the team’s offices. 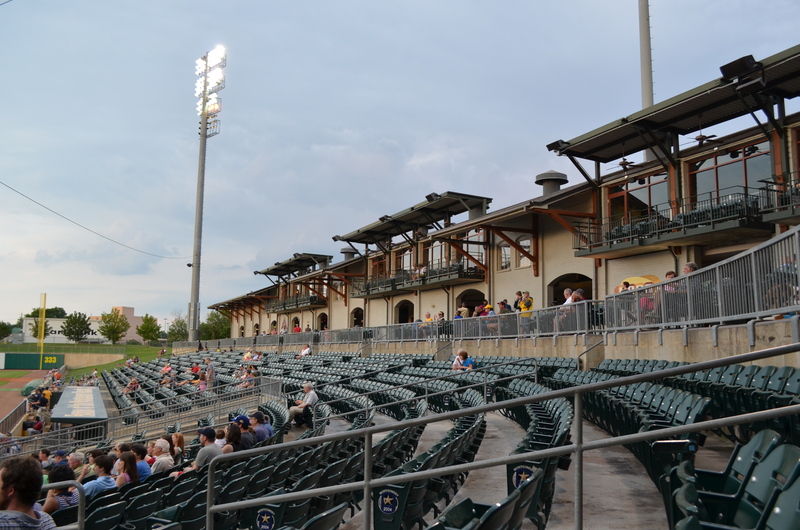 The team built the suites that run down the third base line during construction of the ballpark, and while they have a more modern feel, they fit in seamlessly with the rest of Riverwalk Park. The scoreboard is another aspect that brings this park into the future. 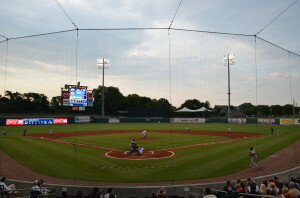 At a cost of over $1 million it is the largest scoreboard in the Southern League. This is paired with the ribbon board that runs along the outfield fence (the only one in the league). Being housed in a former train shed you can see why the team often uses train vernacular throughout the park (Locomotive Loft, Whistle Stop Grille, Club Car Bar, etc.). Train tracks also run right past the left field fence and as trains pass during the game you will often hear the loud whistle of a passing locomotive which is reminiscent of the ballpark in Brewster’s Millions. 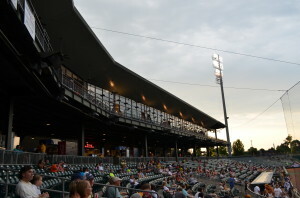 The team offers many opportunities for groups to come out and enjoy a ballgame. The Boxcar Buffet is a large picnic area behind center field that can be rented out and includes an all-you-can-eat buffet. There is also the Locomotive Loft at the end of the suite level down the third base side which can also be rented out for a large group. 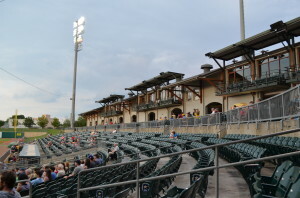 The Whistle Stop Grille is situated in the left field corner and offers picnic tables for groups. There is also the traditional berm seating that wraps around the right field corner. The team also carries the biscuit theme throughout the park. Starting with the team colors (“Butter and Blue”) to the mascot, Big Mo, the biscuit eater. Of course biscuits were readily available at many concession stands, and are a big seller for the team. Sarah told us that on the park’s opening weekend, all the biscuits purchased for the entire homestand were sold out before they were halfway through the first night’s game. Back in the Biscuit Basket, we also discovered one of our favorite novelties of all time – the biscuit hat, which would rival the cheese head any day (sorry Pack fans). They haven’t been able to make a live mascot for their team’s actual namesake, the Biscuit (even though he adorns many of the t-shirts, hats, and jerseys in the team shop) but rumor has it that it’s in the works. And the finally, probably the best part of the Biscuit namesake is the biscuit toss; between innings the team’s staff (referred to as the Biscuit Bunch) throws hot fresh biscuits into the crowd. Definitely a crowd favorite! Another area where the stadium stands out was in the beer department. There were multiple options for craft beer throughout the park. A small concession stand on the concourse showcased the craft beers they had to offer including Back Forty (a local favorite), Sierra Nevada, Goose Island, and Kona. Back at the Club Car Bar there were additional options. However, where this park really shines is in the people. We were lucky enough to have a very knowledgeable tour guide for our visit. Sarah, knew every detail you could imagine about the ballpark right down to the number of drains throughout the stadium (62 – each with the Biscuits logo). We were able to get a behind the scenes look during the game, from the pressbox to the dugouts. We were also interviewed during the game on News Radio 1440 (a first for us!). During our tour we also met Larry, an usher who gave us the history of minor league baseball in Montgomery. This team took the term southern hospitality to the next level. 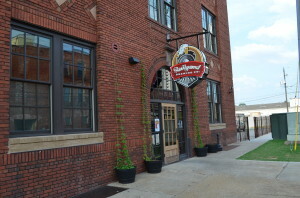 Montgomery can be a little bit out of the way for many ballpark (and beer) chasers. 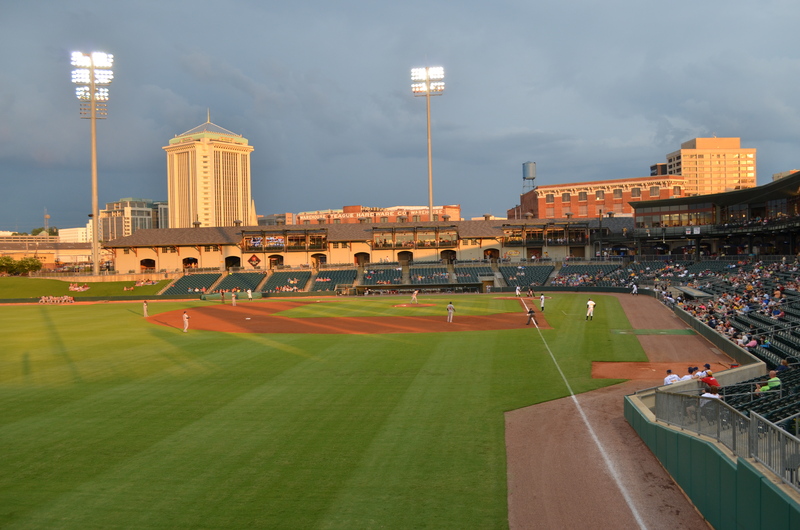 However, with one of the best names in all of Minor League Baseball (and a worthy team store) and one of the nicest ballparks as well we can’t recommend a visit to Montgomery Riverwalk Stadium enough. Beer Basics: Centrally located with the added bonus that a “to go” beer just means you want to take a cup and go for a walk around downtown. 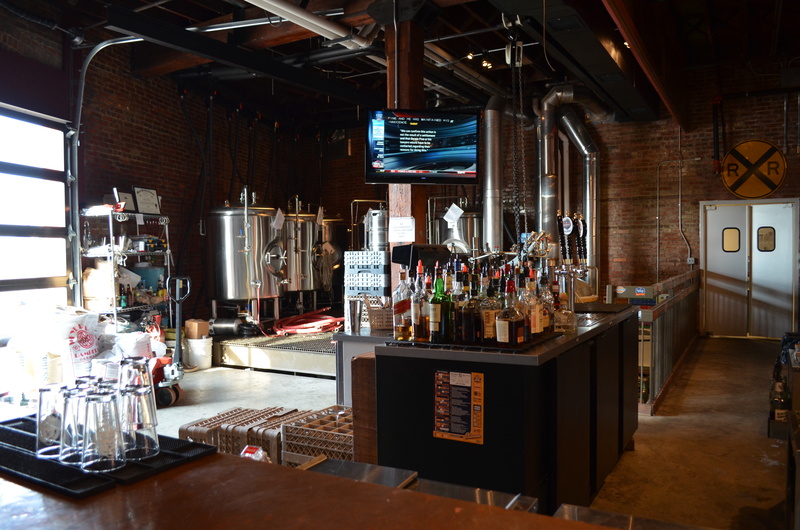 Walk less than a block from the Biscuits home at Riverwalk Stadium and you’ll find the oh-so conveniently located Railyard Brewing Company. Two red flags made us unsure of what we would find at this spot. First, the train motif. Definitely a lot to work with there, but it’s easy to get very hokey when an overarching theme is involved. Secondly, it is owned by a serial restaurateur who also owns two other restaurants in the tiny surrounding downtown area. Owning other businesses doesn’t mean things will go bad – our own hometown gets quite excited with one of our local restaurant groups announce that they are opening another location – but it does increase the odds that someone who is talented in other areas just up and decided to start brewing one day. Like a musician who decides to act; sometimes it works (Justin Timberlake) sometimes it doesn’t (Ice-T). In this case, we were happy to find that the owners and head brewer Kade Miller seem to know what they’re doing. The repurposed train yard holds true to a lot of its history and the architecture of the brewery holds true to the buildings’ origins with high ceilings, original exposed wood framing and brickwork. The seating options are many, booths, hi-tops, tables, bar stools and the space is somehow one big room that’s got intimate spots at the same time. From the main entry door, the brew works is in the far corner surrounded by the kitchen on the right and the bar on the left. Despite the many chairs and tables, there is a minimialist feel to the place as well. It’s open with no walls and has no real bar back to speak of; just an island with 4 taps and all of the hard liquor options set out on a bar mat. Storage seems to mostly be the floor behind the bar island, and inlcudes a bay door where deliveries may occur. German Pilsner (5% ABV/25.5 IBU) A Barvarian pilsner brewed with all German ingredients including the Wyermann malts and the hop varietals (Hallertauer, Perle and Tettnenger). It smells light and bready and is the color of sparkling grape juice. Lacing is thin and carbonation is fluttery and light. Flavor is similarly light, with a sweet airy taste that could be paired with almost anything. Belgian Golden Ale (5% ABV IBU unavailable) – Has a banana Belgian malt smell that is even stronger in the taste of the ale then it is in the aroma. The beers in this flight seem to have come in paired colors; the first two were almost identical in hue, same with the next two, and then the final two. So this one is was basically the same white grape juice color as the first, and like the aforementioned pilsner it is still sweetish and good for summer but the Golden Ale but has more of a body than the Pilsner and a surprising amount of flavor. Fireman’s Red Ale (5% ABV/ 22.8 IBU) – The Fireman is an Irish Red Ale with a strong caramel aroma and caramel-toffee color. Terri our bartender recommended this as her favorite, and not only did her description sell us on it, it sold the guy next to us as well. She didn’t steer us wrong. Malty palate with complimentary carmel and maybe even a little brown sugar flavors, a medium body and medium carbonation, makes this Red kind of like a Brown Ale crossover, and a very good beer. Devil’s Marmalade (9.7% ABV/ 28.8 IBU) – This Wee Heavy/Scottish Strong ale is not a normal beer. It smells like a whiskey and is the color of one too. The official RBC description of this one includes words like “toffee” and “sweet finish” but don’t believe everything you read. In our opinion, you taste all 10% of that ABV, and a licorice kick that is also in the nose of the beer adds to the bite of this aptly named ale. EIther of us would have been hard pressed to do an entire glass of this one, but worth getting the taster as it was unlike any other Wee Heavy we have had. Honey Porter (6.5% ABV/ 24.1 IBU) – Coke colored with a light coffee smell, a drier flavor and light finish. Not sweet or thick, and although it is a honey porter it really is the coffee that comes through in the palate. More specifically almost like a lightly burnt coffee; which isn’t a terribly appealing description, but smoked or roasted just didn’t fit exactly. Double Stack Oatmeal Stout (4.5% ABV/ 31.3 IBU) – Similar color as above, but with a thinner, sweeter aroma. At first smell we actually thought they might have gotten switched in the flight order (as in this was the honey porter) but upon tasting we knew that we had them correct. Again the main taste is coffee but this does have a sweet smoky taste in bouquet, palate and afterwards as well. Alabama Pale Ale (6.8% ABV/6.4 IBU) – We were informed that this American Pale Ale was hoppy enough to be a palate killer, and that’s why we saved it for last. And while the hops were strong, it wasn’t crazy hopped. Smells dry, tastes dry and well hopped with a slight earthy flavor. A good pale ale.